Is the 'New Normal' Simply Substandard? Or Are Trade Wars to Blame? The beat goes on…only it is much fainter than it has been, sort of like Sonny without Cher. Growth does remain in gear, but it is some of the weakest we have seen in the last four years and that is what the rank/queue standings in the table tell us. Zero for the EMU composite, 2% for the German composite, and zero for Italy's composite. With a ranking in its 34.7 percentile, the U.S. composite has the strongest reading in the table. And for these metrics, the median level occurs at a ranking of 50%. 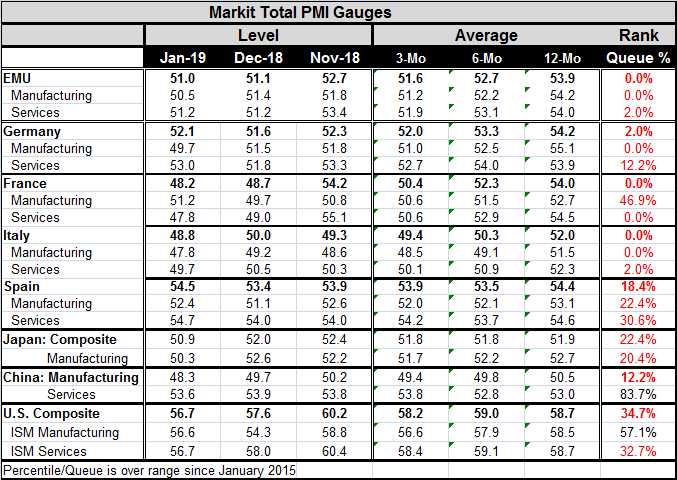 Actually, a number of the PMI gauges are not even endorsing the notion of continued growth. Two service sectors, one in France and one in Italy, point to contraction. In both cases, the service sectors dominate to make the overall PMI into a contracting signal as well. Separately, China, Italy and Germany show contracting signals from their respective manufacturing sectors. The EMU tells us that it has the weakest composite index in four years and the weakest manufacturing sector and that its service sector reading is tied for the weakest in four years, tied with the reading from last month. These are weak absolute readings and they depict very poor momentum as well. Just to stir the pot a bit, a UN trade official warned of 'massive' implications for the global economy if the U.S. were to slap elevated tariffs on China. The UN has somewhat hilariously pointed out that Asian nations would suffer the most from a trade war. That is the point! These are mercantilistic countries promoting export-led growth and running persistent current account surpluses, stockpiling official reserves to enable them to weaken their currencies and to continue to keep, extend and promote their trade advantage. This is not free trade! Trump wants this sort of thing to stop. He wants to promote two-way trade - the way it is supposed to be. Many people do not study trade theory, but there are not supposed to be specialty producing countries and specialist consuming countries. That is not how free trade works. Tariffs are not good and I am not pretending that they are. But they are the lever to move China from its immoveable perch as a trade abuser. I am intrigued and puzzled by the ongoing Brexit discussions which seem to be at an impasse, but I read that the insiders do not expect a hard Brexit. To an outsider, it seems that is all that is left. But insiders expect a postponement of the U.K. 'leave' date…but then what? Theresa May has negotiated the best deal she could, given some really poor support at home where vultures circled her waiting for her to fail so they could swoop in and replace her. But there is nothing there worth taking over. The Prime Minister has been backed against the wall of no return. And no one wants that spot. Meanwhile, short of a new referendum and a decision to stay I don't see what 'new deal' is there for the U.K. to cut unless it is going entirely backtrack and capitulate to the sovereignty of the customs union the same union that the people just voted to leave. In addition to Brexit issues, there are a number of important additional sticking points on the trade front. The U.S. 'NAFTA' replacement deal is not yet approved and the U.S. has ongoing, but under the radar, talks with the EU over trade….tick-tock! Chicago's Booth school has had a panel of 43 economists (economic experts) evaluate the statement: "Imposing new US tariffs on steel and aluminum will improve Americans' welfare" (here). Of course these are the worst of the Trump tariffs. And few like them. All 43 Booth survey participants disagreed with the statement, however, one and only one, David Autor from MIT, who still disagreed with the statement, offered this, "Simple answer is no! Complex answer is that this could be a strategic gambit in a longer game that deters abuse of free trade agreements." So 42 of 43 of the Booth School's panel of expert economists were not even open to that as a possibility. This, I think, is the real point of the Trump tariffs and economists are clueless to evaluate the approach. Economists are used to looking at comparative static paradigms. Look at a free trade system. Now impose tariffs. Which is better? That answer is clear. But we do not start with a free trade system. We start with a flawed system. Then we do not want to end the evaluation after imposing tariffs. We want to threaten waving the big tariff stick and try to use that to leverage a better deal. This survey is an example why I think that most comments made by economists about Trump and tariffs are completely worthless. In fairness to Booth, it only asked about the steel and aluminum tariffs and that is really not a very interesting forum for discussion. Still, few economists evaluate the policy in the correct paradigm. It is not a stand-alone. Trade tensions underlay a lot of the economic weakness. But this policy is not simply a tariff gambit. This is an investment in the future of the United States and a pushing of a real 'reset' button. This is an attempt to make China play fair. There is a lot at stake. Global growth will be affected if China does not bend to the rules of fair play. The UN is right to put out a warning, but I do think of it as rather obvious. We live in times of great economic and geopolitical upheaval. There is a lot of stress in Latin America, with Venezuela the best example of that, along with the caravans of disillusioned people headed for the U.S. Southern border. The EU and EMU are having difficulties with members like Italy that want more slack and like aspiring former member, the U.K., that was fed up with cloying and spreading centralized EU-control. Russia grabbed the Crimean peninsula and is trying to destabilize Ukraine. The Middle East is one constant in all of this as it remains a mess as the U.S. and EU seek to have very different relationships with Iran. China is trying to spread its influence through its belt and road program that has been substantially unmasked as stealth coercion. More overtly, China grabbed the South China Sea and increased its bellicose tone with Taiwan. The U.S. trade pressures fit nicely into this picture and they are part of the forces of good not of evil, at least that's how I see it. The U.S. is hardly out on its own destabilizing world growth as some would have you believe. In fact, if the U.S. is successful, its actions could usher in a long period of expanded freer trade that is better in line with the true principles of free trade with much more balanced growth and greater upside for everyone. Still, it may not turn out that way either. With Donald Trump at the wheel, you can only hope you are driving an all-terrain vehicle because you never know which way he is going to turn or if he will even stay on the road.